CBS White House correspondent Peter Maer can still pinpoint when he decided to become a journalist - at 8 years old, in Granite City. Though he was at first unsure as to whether he would prefer working in print or broadcast media, one thing was certain. "I always wanted to cover Washington," he said. His dream came true. For 23 years, Maer worked for NBC, beginning as a general assignment reporter before becoming a Senate correspondent and, beginning in 1986, a White House correspondent. As a high school student, Maer began to dabble in the media, serving as the editor of his high school newspaper and working at a radio station in Granite City. At the radio station, he broadcast a weekly show for high school students, including popular music and sports. As a college student, he worked in Granite City, Belleville and St. Louis to expand his skills in broadcast journalism. In 1970, Maer graduated from SIUE in the first class of mass communications majors. From there, he worked as a news director at WIBV in Belleville. Later, his career took him to work in Nashville, Tenn., before he ultimately moved to Washington, D.C. In 1998, Maer went from NBC to CBS, where he has covered the White House for nearly a decade. Though his role in broadcast has led him to cover every president since Jimmy Carter, Maer recalls a 1985 disaster far from Washington as the most memorable news event of his career thus far. "I covered the Mexico City earthquake, where I watched thousands and thousands of people die in the rubble," he said. More recently, Maer traveled to Southeast Asia to survey tsunami damage alongside former Presidents George H. W. Bush and Bill Clinton. He explained that these sobering events reminded him of the "fragility" in life, putting his professional role into perspective. Earlier this year, Maer was selected as a guest speaker for spring commencement. 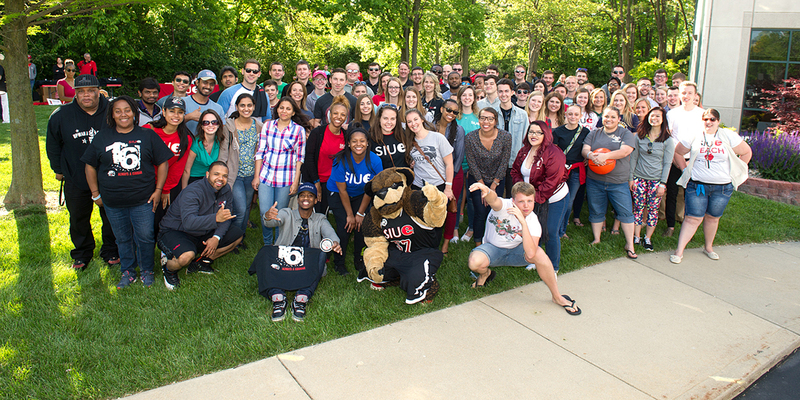 "I was just thrilled to see how SIU has changed in so many ways when I was on the campus," he said. In addition to selecting Maer to deliver the keynote address, the university conferred upon him an honorary doctorate in human letters. "It's a funny thing to give a journalist," Maer said, noting he was "flattered beyond belief." According to Kim Durr, executive assistant to Chancellor Vaughn Vandegrift, Maer was nominated for the recognition based on his involvement with the university. "He was also chosen for his contributions to greater society," Durr said. Maer recalled professors Jack Shaheen and the late Kamil Winter among his greatest influences at SIUE. More than 35 years after Maer's graduation, he and Shaheen continue to keep in contact. "I think he was born with an integrity gene of some sort," Shaheen said, recounting an instance in which Maer refused to pull a story that spoke negatively about a sponsor while working at a radio station in Belleville. "He was never willing to compromise his beliefs." Shaheen also cited Maer's "intense interest in all things related to news" as a reason for his success. "He never reached into the pop culture bag," Shaheen said. "It was always news, news, news." Additionally, Shaheen said Maer's dedication to reporting on - not becoming part of - the news remains a testament to his journalistic integrity. "There was never a desire to be in the limelight," Shaheen said. Maer says his career has given him a perspective of current events that few people are able to experience. "It's a ringside seat to history," he said, "and it's been one unbelievable ride." Originally printed in the Spring 2008 edition of the Mass Communicator. Story by SIUE student Megan McClure.